"I began playing guitar at the age of nine and was soon making music in bands. By the time I studied electronics formally at college I was already building guitar and studio equipment. I'd make anything we needed at the time, and I had to do it on a real shoestring budget. When I finished college I headed to university to study guitar full-time, and I was soon repairing and modifying equipment for customers whilst I worked at a guitar shop. Some great pieces came through during that time, including an early Gibson ES-355 that belonged to Chuck Berry and one of the first ever four input Marshall amplifiers." Pictured: Rhys ﻿﻿recording ﻿﻿with an early incarnation of what would later become the King Fuzz pedal. "Money was always tight when we were playing in bands, so I built my own portable recording rig. We would make temporary studios anywhere from log cabins in Devon to farm houses in France. Eventually, we found the perfect location in South-East England and built a permanent studio; five prolific years ensued and we made some great records there." Pictured: This is the first and only all valve (tube) portable recording studio in the world. It took three years to design and build, and features eighteen valves. ﻿﻿"Around the time I finished my guitar diploma, Gibson flew me to Nashville to show me their manufacturing processes in detail. I fell in love with the craftsmanship I saw at their archaic Custom division, and it fuelled my obsession with developing my own creations. After six years of working in guitar shops, I decided to quit to focus on creating full-time. As a free-lancer I worked on some really interesting projects; repairing the mechanism of a 1930's German pedal steel guitar with my brazing torch, zinc-electroplating drum hardware with my home made dipping bath, and everything in-between.﻿"
​Pictured: The first ever Octo P﻿﻿u﻿﻿ss pedal. Cut, folded, machined, brazed and engraved entirely by hand from sheet steel. "For many years I specialised in valve circuits, which lead to me working as an electronic design engineer for Vortexion, a fantastic audio equipment manufacturer from Wimbledon, England. Prototyping valve electronics for them was a very exciting time, and it fuelled my creativity enormously. I grew so enamoured with the Vortexion brand, with it's timeless design classics and wonderful heritage, that I was inspired to found a new British musical company that could continue in this tradition." Pictured: One of Rhys's amplifiers, designed with the less ubiquitous ECC81, ECC82, and E34L valves, and featuring only a volume control. "Having toured and made records extensively, I finally found the perfect place to live and work in Herefordshire. I'm endlessly tinkering, electronics, guitars, composing, recording, animating or writing. I feel incredibly lucky to call this my job." 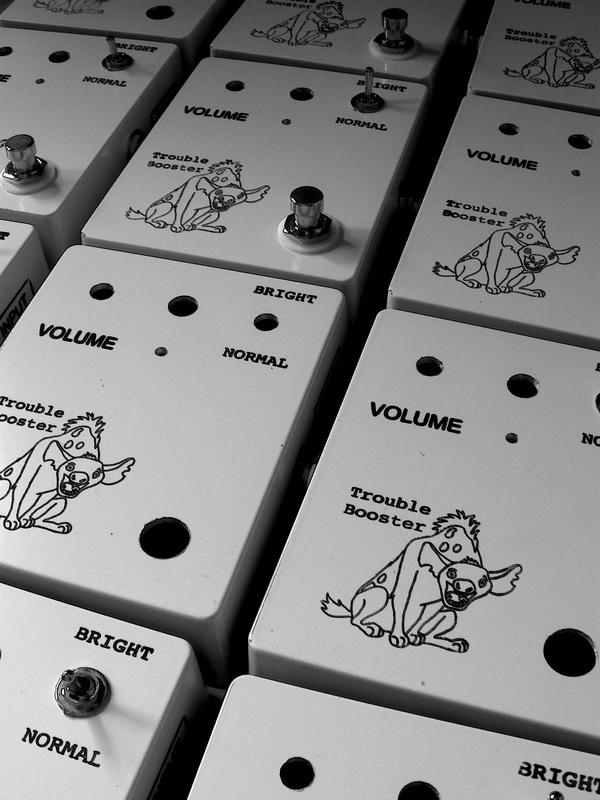 Pictured: Bigfoot guitar pedals being manufactured by hand.